The final model in this long running series, replacing the Beomaster 4000. From the outside, the Beomaster 4400 was set apart from previous models by its angled control panel, though the controls were largely in their normal positions. The facia finish returned to natural aluminium, and aside from detail changes in the functions of some of the switches, it would have been easy to confuse this new top line model for the Beomaster 3000 of 1970. Inside though, it was mostly new. The output power had been raised to 75 watts, at the time the most powerful Beomaster yet made, and the first to exceed the power of the Beolab 5000 system of 1968 (the Beolab 5000 amplifier was rated at 60 watts). This was done using a new technique employing 4 output transistors in each output stage (8 in total), in a novel series circuit. The increased power brought with it a need for better protection, so a latching relay was also included to cut the power if anything went wrong, thus avoiding expensive damage to the loudspeakers. In order to allow the power to be used to its best advantage, an overload lamp was added, taking the place of the stereo indicator of the Beomaster 3000 (the stereo indicator of the 4400 was a small LED lamp over the tuning indicator). This indicated when the output was becoming distorted, and though the amplifier could be used with the lamp either flickering or permanently on without damage, the user knew that the sound quality may have been reduced by the onset of distortion. The device was sensitive, and began to indicate before the sound was audibly distorted. At this level though, it would also be very loud, and the instruction manual noted that “the volume control should be used with discretion”. The Ambiphonic system of simulated 4 channel stereo was carried over from the Beomaster 4000, though the filter for the rear channels was omitted. A switch on the rear panel reconfigured the Ambiphonic loudspeaker sockets to act as normal stereo connections, for use with a second pair of loudspeakers in another room. Another interesting addition to the amplifier section was the “linear” switch, which cut out the treble and bass controls, and disabled the loudness circuit. By removing these sections from the signal path, quality was slightly improved, and the user was assured that the amplifier would be “colouring” the signal as little as possible. Features such as this, the overload indicator and the unusual output stage circuitry would remain a part of the best Beomasters for many years, and were all included on Beomaster 8000, the most powerful and sophisticated one of all. Text copyright © Beocentral. Unauthorised reproduction prohibited. The connections for two tape recorders were carried over from the Beomaster 4000. Again, Tape 1 was intended for open reel machines and included an off-tape monitoring loop. Tape 2 was suggested for a cassette recorder (such as the Beocord 1100), and did not offer monitoring facilities. It was possible to record from one to the other in either direction though. Text copyright © Beocentral. Unauthorised reproduction prohibited. The external appearance of the radio section had altered little from the first Beomaster 3000, the only obvious change was that the scale now went right up to 108MHz. The five preset positions remained unchanged, and the little wheels were just as difficult to adjust! The tuning meter and balance lamps were also still there, but the inclusion of the overload lamp displaced the stereo indicator to a position just above the tuning meter (see above). The radio circuit though had changed a lot, and was far more sensitive than that of the Beomaster 3000. It made use of more and better integrated circuits, and could yield clean stereo performance from far weaker signals. Text copyright © Beocentral. Unauthorised reproduction prohibited. Whilst there was no doubting the excellence of the engineering behind the Beomaster 4400, it enjoyed only limited success. By 1977, it still looked like a model from 7 years previously. 1977 also saw the launch of the Beomaster 1900, a much sleeker and slimmer model, with touch sensitive controls. 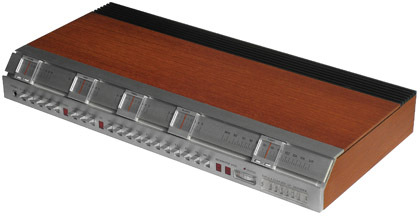 The Beomaster 4400 would be the last of the Beomasters to be made in this style, and was replaced by the Beomaster 6000, which featured black glass and touch buttons in place of teak and slide controls. Text copyright © Beocentral. Unauthorised reproduction prohibited.